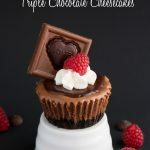 I first shared this recipe on Lil’Luna where I am a contributor. Warm up on a cold winter day with this healthy Minestrone Soup. 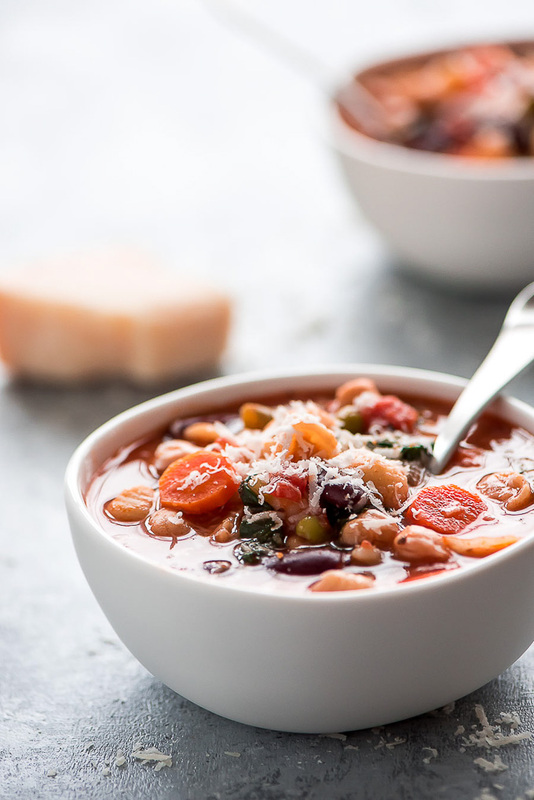 This flavorful Italian soup is packed with various vegetables, broth, beans, and pasta. 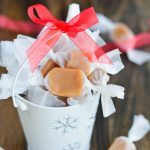 Pin it to your SOUP RECIPES board to SAVE it! Just over here eating some delicious Minestrone Soup because I’m freezing my rear end off. We had a blizzard here the other day and two snow days. It got so cold that our heater couldn’t even keep up one of the days so I’ve been sipping on hot chocolate and eating Texas Chili this Minestrone Soup. As much as I hate the cold, I do love wearing layers upon layers, leggings, and snuggling up in a blanket on the couch. The only thing missing is a fireplace. One day. But for now I’ll just warm up from the inside out with a bowl of soup. Minestrone Soup has a salty tomato and broth base with loads of veggies, beans, barley, and little pasta noodles. 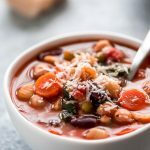 You might be thinking that since this is a meatless soup it’s more of an appetizer but it is hearty and contains a good amount of protein thanks to all those beans and barley. Serve it in a large bowl with some good ole crusty Italian bread and dinner is served! I know lots of people rant and rave over Olive Garden Minestrone Soup but let me tell you a secret- this one is better! This is actually a copycat recipe of Ristorante della Fontana that used to be in downtown Salt Lake City. My mom still talks about how good their Minestrone Soup was and this takes just like! 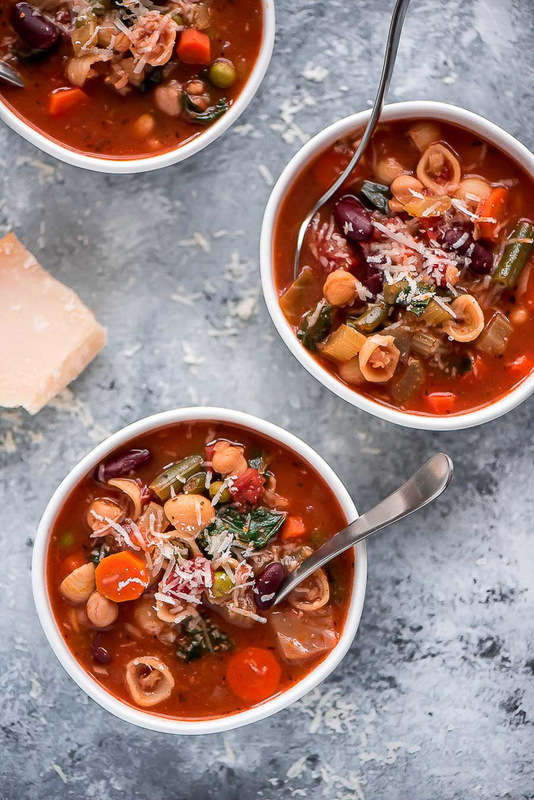 Not only does this Minestrone Soup have amazing flavor, it’s also quite nutritious! While you might get a little intimidated by the long list of ingredients in this soup, just know that it is truly worth it and makes it so flavorful. This soup starts out with cooking the mirepoix (onion, carrots, and celery). 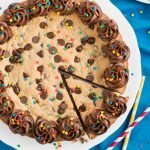 Oh my, does this smell divine! It takes me back to my childhood home and standing next to my mom in the kitchen watching her cook. You cook the veggies in a pot until softened and then you add in almost all the other ingredients and let it simmer so that the vegetables and barley cook. Then you add in the pasta, cabbage, and garbanzo beans. 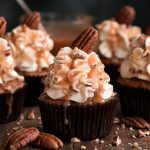 The reason you wait to add these is so they don’t get overdone. No one wants mushy noodles. Close to the very end you add the frozen peas and green beans and stir in the spinach. This ensures that they don’t get over cooked and have that ugly school lunch green bean color. You know what I’m talking about. Ladle it into some bowls and dinner or lunch is served! Garnish with some fresh Parmesan cheese, serve with some crusty bread and enjoy! 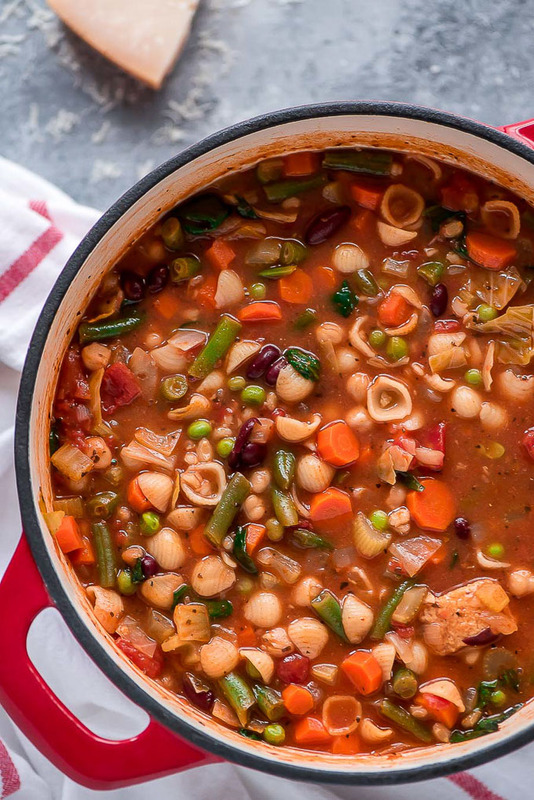 Warm up on a cold winter day with this healthy Minestrone Soup. 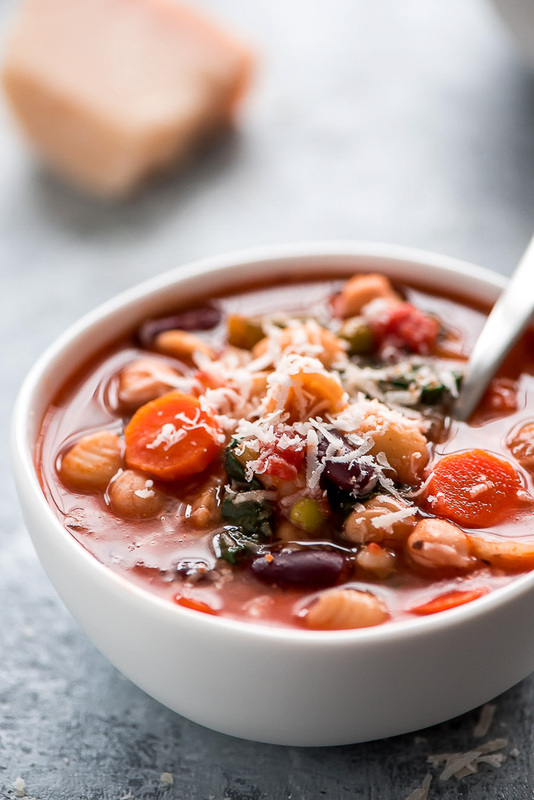 This flavorful Italian soup is packed with various vegetables, broth, beans, and pasta. Heat oil in a large stock pot and add the onion, carrots, and celery. Cook for about 5 minutes until onions are tender. Add the garlic and cook 30 seconds. Stir in the seasonings, tomatoes, and tomato paste, and then the water, bouillon, kidney beans, barley, and Parmesan rind. Bring to a boil. Cover, reduce heat and simmer for 30 minutes. Add the pasta, garbanzo beans, and cabbage, cover and simmer 10 more minutes. Add the green beans and peas and cook covered for another 5 minutes. Stir in the spinach. Serve soup topped with Parmesan. If you don’t have bullion could you use canned broth? If so how much? Thanks! You’ll substitute the 13 cups of water with 7 cups beef bouillon and 6 cups chicken bouillon. If you want it vegetarian you can just use 13 cups vegetable broth.